In the late 1960s Formula 1 cars first experimented with the addition of wings and they were found so vital that we’ve not looked back. As we know their purpose is to produce extra downforce (additional to that created by the car chassis alone) so as to increase the amount of grip that the tyres can generate while the car is on track, therefore improving the speed at which a car can take the corners. In this Tech Spec we break down some of the reasons F1 wings are designed the way they are – in particular reasons for the elements and endplates being shaped as they currently are. I’m sure we’ve all seen before explanations of how a wing works, but for completeness and just in case there is anyone who has missed these, let’s do this one more time. Wings work due to the passage of air over the upper and lower surfaces. The combination of the aerofoil shape and angle of attack causes air to flow faster over the longer side of the wing (red arrows) compared to that over the shorter side (blue arrows). 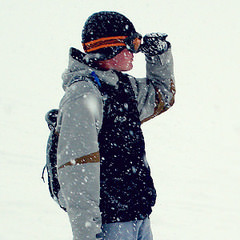 The faster flow creates an area of low pressure versus slower flow generating a region of comparatively higher pressure. The pressure differential together with the tandem affect of the ‘circulation’ of the flows around the wing produces the desired force. On an aeroplane the aerofoil has the longer side on the upper surface of the wing so that the force generated is lift, for an F1 car the wing is placed the other way up so that it generates downforce. The green arrow on the diagram indicates the direction of the net force created from the aerofoil, and it is worth noting that although the majority of the force is directed in the desired direction (i.e. downwards), there is also a component that acts against the direction of travel which acts to slow the car to some degree. Another negative effect is that the flow that is shed from the trailing edge can be disturbed and turbulent. In addition to creating drag which will also slow a car slightly, it means that any surfaces that come in contact with this disturbed flow will work less efficiently. In turn, that means that cars can find it harder to run close up in another car’s wake or the pieces of bodywork towards the rear of the car may not function quite as they might have in the isolation of a wind tunnel scenario. To solve the latter, teams and engineers try their best to re-establish laminar flow (or flow as close to that as they can. Laminar flow is essentially where all the particles are travelling parallel to each other. Together these provide the majority of the downforce for the rear of the car, trying to keep the rear wheels firmly in contact with the road so that the power is distributed without the wheels spinning, the braking forces are applied evenly, as well as trying to prevent the car oversteering as it corners at speed. 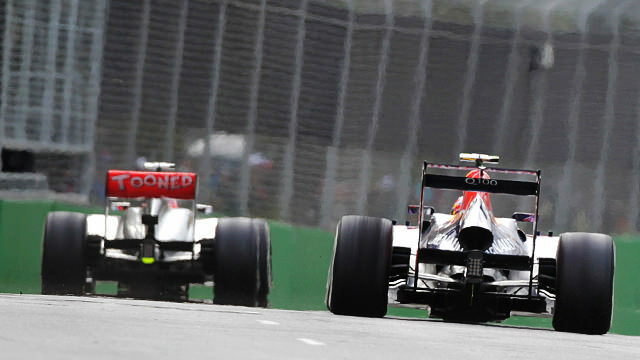 DRS showdown: Red Bull with an open rear wing challenges McLarenCredit: Pirelli S.p.A. The beam wing is predominantly horizontal and attached to the rear crash structure at the height of the rain light; it is comprised of a single plane that stretches between the rear wing endplates. It is also the location of the little winglet that some cars run, dubbed the Monkey Seat (obviously). There is no restriction on bodywork in this area so teams utilise this to add to their downforce (as well as any routing for a DRD out-duct). Over recent years the main planes of the rear wing have become simplified and are currently restricted to two elements – this is part of the cars’ downforce being restricted so that they ultimately cannot drive as fast around corners (thus ensuring a level of safety is preserved). The upper plane forms the DRS and can articulate to reduce its angle of attack, thereby reducing the amount of downforce and drag generated and allowing the car to drive faster – specifically to aid overtaking. 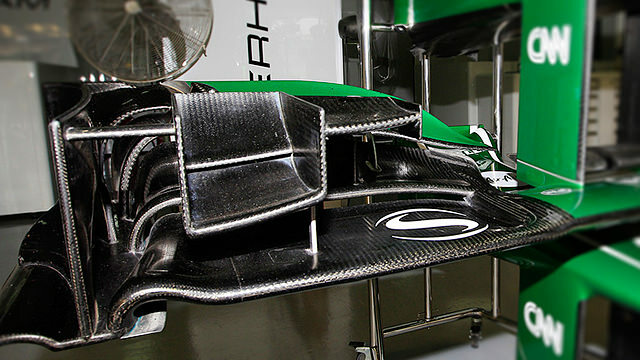 The rear wing endplates are not just there to hold the wing up, nor are they there just to display sponsors logos, they also perform a function in generating downforce (or at least minimising any potential loss) – they help to seal the different pressure regions above and below the planes, the greater the pressure difference then the more force that is produced. However, there is an issue at the top of the end-plate, as the wing is mounted right at the top there is nothing separating the flow over it from the flow around the outside the pylon. This causes vortices to be produced from the outer tips and can be seen specifically well in wet or very humid races where the low pressure at the heart of the vortex causes water in the air to condense out and form the telltale spiral shape. Vortices in this area will reduce the effective length of the span and so the effectiveness of the wing as a whole. The solution to this is to add a series of cut-outs in the vertical sections in key areas at the top of the end-plates. This allows a controlled amount of high pressure flow (from above) to bleed through into the lower pressure area (outside), reducing the strength of the vortex that is generated and thus ensuring the wing works at maximum efficiency. 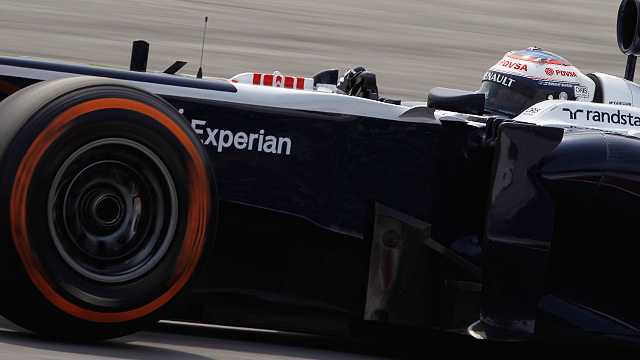 In comparison to the simplicity of the rear wing, the front wing is vastly more complicated. The reasons for this are twofold: it is the first part of the car to touch the oncoming air so has to try to minimise any turbulence as well as generating downforce for the front end. Its main job is to keep the front wheels anchored to the road (in a similar way to the rears) so that the car doesn’t understeer. The job of the front wing is made harder as F1 remains an open wheel formula. The spinning front tyres shed turbulent flow which can be disastrous for the aero surfaces downstream. The front wing is packed with different elements so that as much flow as possible is directed around or over the wheel so that it can rejoin and reform an undisturbed stream, so the rear wing, beam wing, brake ducts (etc) can work efficiently. These series of diagrams are a representation of the flow profiles around the front wing. The different groupings of flows are colour coded so that they correspond between each diagram so you can infer what flows are doing in all three dimensions. Take it as read that all parts of the flow generate downforce to some extent. The red and orange flows travel over the central portion of the front wing, generating downforce as it goes and is not redirected. It will be taken later by the splitter and tea-tray as it is sucked under the floor and used to energise the diffuser. The yellow and green flows interact with the elements in the middle of the plane on the wing and is re-routed around the inside of the front wheel. It will be ingested by the brake ducts (to cool the brakes), flow over the front suspension and then into/over/around the sidepods. The blue flow is directed up and over the tyre by the outer cascade elements. It also fills in from above some of the flow behind the front wheel and so might also be drawn into/around the sidepods or under the floor. The purple flow is routed by the endplate around the outside of the wheel, by both the shape as well as through the cut-outs that are present. It fills in the rest of the flow behind the front wheel; however its path next to the spinning wheel (without travelling over any aero surfaces, like the suspension on the inboard side) means that it can be more disturbed and turbulent than might be optimal. This might affect the under-floor, the performance of the diffuser, and other parts of the car that are downstream of this point. Here’s how the pros do it; Gary Anderson’s Red Bull front wing flow. 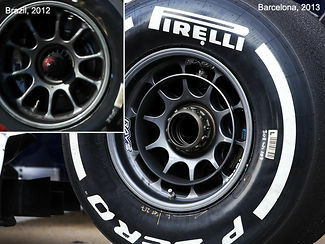 In response to some of the downsides to the purple flow over the spinning outer surface of the wheel, Williams have introduced us to their take on the ‘blown wheel nuts’ solution – it takes air from inboard of the front wheel and injects a relatively smooth flow outboard with the aim of cleaning up turbulence in this area, therefore smoothing out the flow that will be reused further back down the car. More specifically it channels air from the brake ducts and directs it up a pipe that is placed inside the hollow axle. Introducing extra flow in this position should stabilise the flow around and (most importantly) behind the front tyres. It should to some degree improve the performance of the car, but it is clear that the FW35 has bigger problems just in this area. Last year Red Bull tried to implement a similar system, but fell foul of the rules. Their version had the exit outlets positioned at end of the axle, outside of the wheel nut. This contravened the position of ducting and so was thrown out before it could be raced. Williams have thought at great lengths to ensure that they comply with the rules and their system is legal and has been raced. However there is a potential downside; in getting themselves to this position they now have a much harder task during pit stops. Normally the gun man has a nice pointy axel to aim for and help locate his gun as he is rapidly trying to release/tighten the nut. The Williams mechanic on the other hand will have to make sure his aim is true and is at the perfect angle to the nut or will risk cross-threading it or graunching off the external metalwork; wasting precious seconds or worse. It is fair to say that during the pre-season tests they put in a lot of practice to make sure they are all up to speed when it comes to the pressure of Sunday afternoons. During the 2013 Australian Grand Prix Williams clocked pit stop times that were longer than the top teams and, more importantly for them, the other teams that they’d like to be competing with. During the recent Malaysian Grand Prix they recorded times that compared similarly to those posted in Oz. They were on the longer side and notably with a couple that looked too long for a racing stop if you ask me, but then again nowhere as bad as Force India’s showing. The issue with the SFIF1 nuts is a mechanical tweak and apparently easily fixable, whereas the Williams system will take practise to overcome. Although I’ve not found the raw stationary times extrapolating from the in-pit times and subtracting the pit loss for each circuit can allow us to draw these conclusions, i.e. the overall losses suggest they might be taking more time to carefully use their wheel guns on the trickier nuts. They really do need to be getting better at this or the gains they make around the circuit (performance or position) might be wiped out during the pit stops. Looking towards to 2014, next season the front wing will be slightly narrower, but it is safe to say the front wings will stay as complicated as ever, to try to ensure the desired amount of downforce is generated as well as trying to leave the air flow as undisturbed as possible. Changes at the rear; the beam wing is gone and the rear wing will have to be shallower. I dare say steps will be taken to ensure the cars can retain levels of downforce at the rear and so remain balanced… another diffuser innovation on the way, perhaps. Previous article A modest improvement or the vanity of others?